Tumblr has today announced that it is rolling out a new feature called Fan Mail, an interblog messaging service that users of the popular blogging platform can use to communicate with one another from within their accounts. The Fan Mail can be sent from your Tumblr Inbox, avatar menus or with an icon that will be located in the top corner of any of the blogs that you follow while logged in. This should allow you to leave messages behind that expand beyond a simple ‘note’ left on a Tumbl, or the minimal ‘so and so liked this’ message. This is essentially adding a private commenting or feedback system so that Tumblr users can leave behind encouraging (or critical) messages on Tumblr posts that they visit. Think of it as a private commenting system between the blogger and the reader, that doesn’t involve other visitors. Frankly, it seems like an interesting spin on user comments that could allow for a more personal and productive interaction between the consumer and creator. We have all seen productive comment threads hijacked by trolls. This kind of messaging could allow for an echo-free environment that encourages users to be more human about the way that they talk to the owner of the blog. It will be interesting to see how this new feature is adopted by Tumblr users. 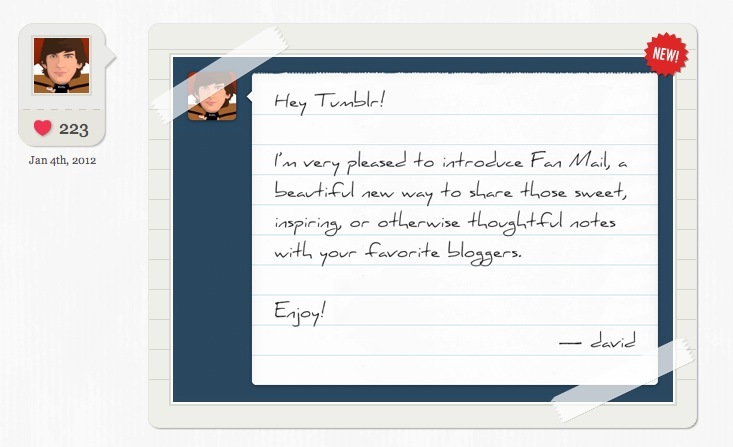 The Fan Mail feature should be rolling out over the next few days for all Tumblr users.